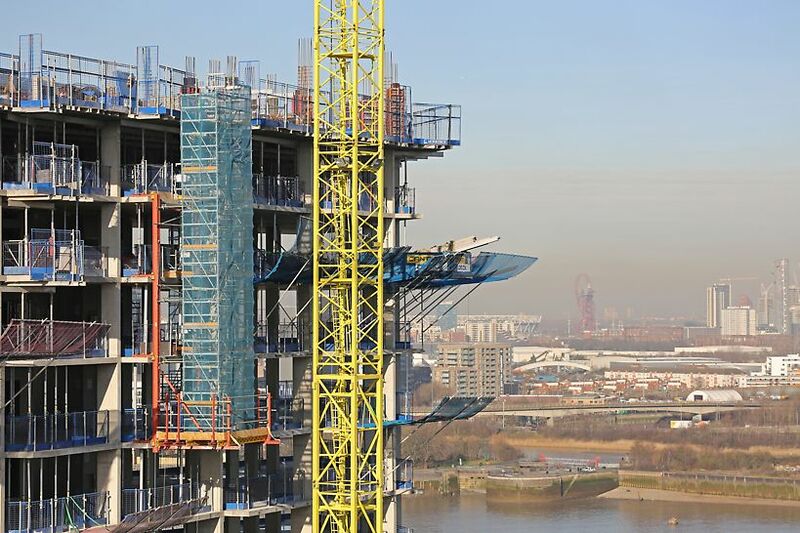 Knightdragon commissioned AJM for the construction of Upper Riverside No.1 & No.2, which will provide 450 new homes in the Greenwich Peninsula area. 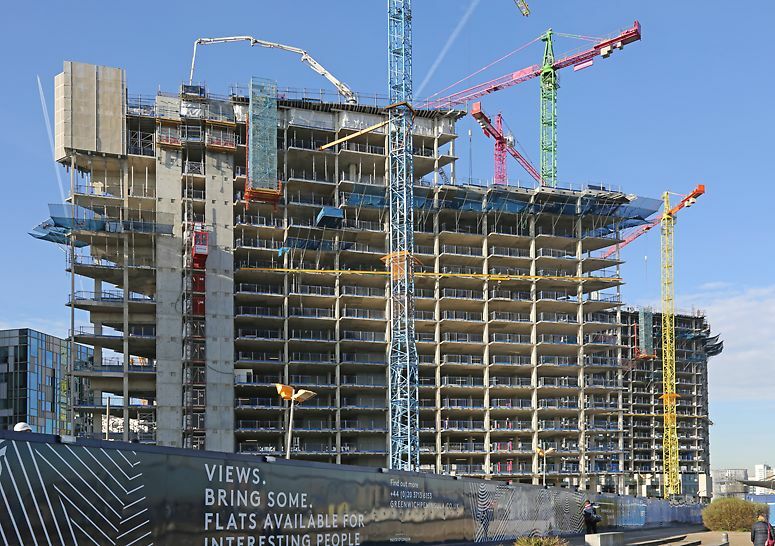 Construction on blocks 1 and 2 of the residential hot spot commenced in 2015. Since the start of the project, space has been a primary concern due to the structure’s close proximity to the River Thames. 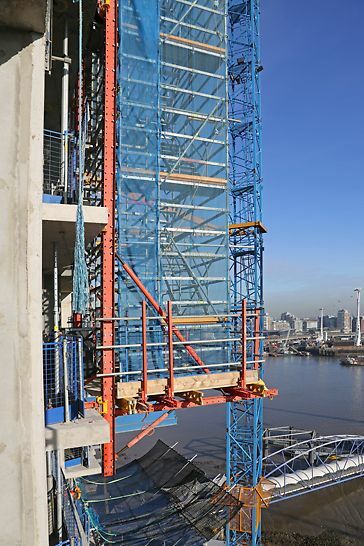 AJM required an access system that made it feasible to enter both sides of the building on all floors. As with any high-rise, this also had to take safety into account when working at height. 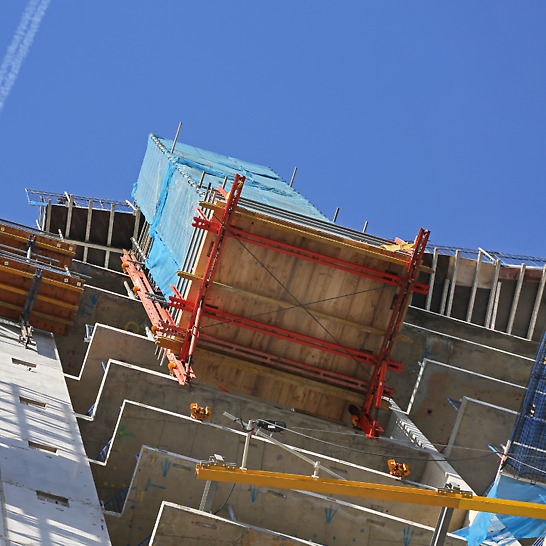 Safety coupled with short cycle times meant that an agile and accurate solution was required. Setting up the system was a lot easier and didn’t require a lot of manual labour compared to traditional access system. This was a huge benefit for us in terms of time. The combined PERI solution allowed us to have our own space where we wouldn’t disrupt the rest of the process or other contractors on site. The key to the solution was collaboration. AJM proposed installing a staircase which would suspend from cured concrete slabs on the structure, resembling a cantilever deck. Through close liaison with the client, we combined this idea with the RCS Rail-Climbing system which lifted the access tower by a hydraulic pump. The hydraulic pump was then placed on a rail secured by anchors that were rooted into the concrete, in order to handle the dead load. We installed flexible height flights on the access system. 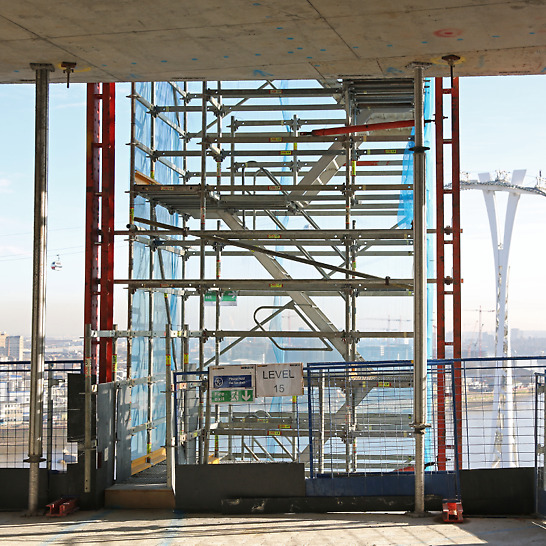 This enabled the staircase and run-off to be adjusted according to each floor, enabling AJM to work with varying pour heights from floor to floor. We also accounted for safety measures. 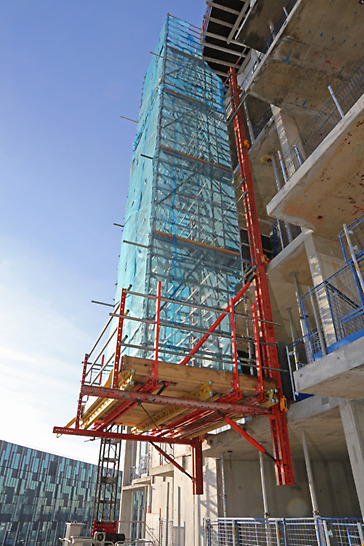 The access tower was fitted with handrails, toe-boards and netting to enhance security and ensure that labourers were comfortable in their working environment, regardless of how high the tower structure was. By combining PERI products, AJM were able to utilise more space on site, especially as space was already limited. This freed up vital space at ground level, allowing labourers to move around easily and resume working. The system climbed all at once, without requiring manual labour to frequently erect and dismantle modular components as the structure ascended. 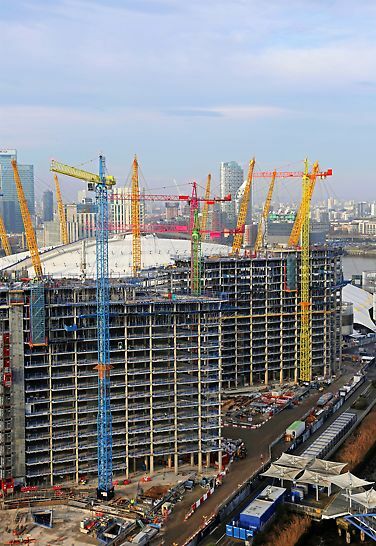 As a result, the project also benefitted from reduced crane use in the event of windy weather. 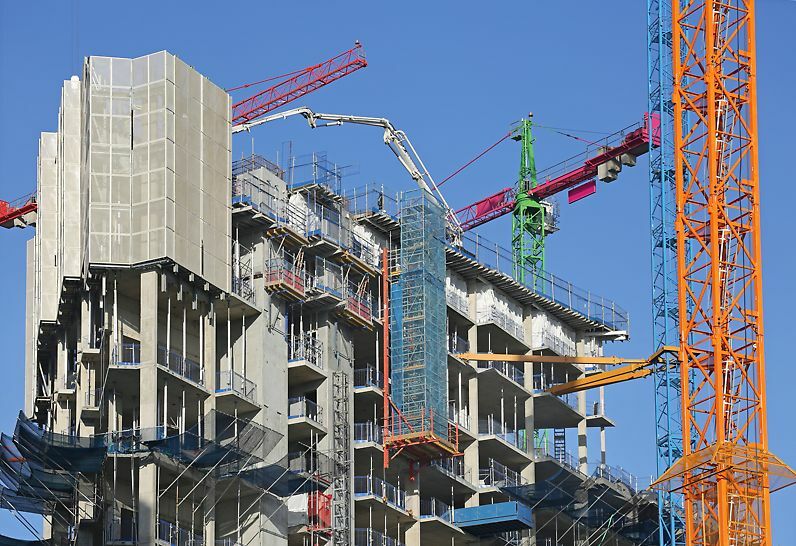 The solution shortened cycle times, which meant that AJM were ahead of the scheduled critical path and were in a position where they had to slow down in order to meet the handover process with other contractors.